Living in Boston affords me direct access to a vibrant scientific community. Just across the river in Cambridge you can find amazing universities and research centers alongside pharmaceutical companies just about everywhere you look. It’s perhaps not surprising that this environment is also home to a lively, 10 day festival that brings hundreds of events around “science” writ large to the Cambridge community. I’m not really a scientist, but I was pretty proud of my posters. Photo by Brian J. Abraham. Science festivals are a great place to put science communication into practice. 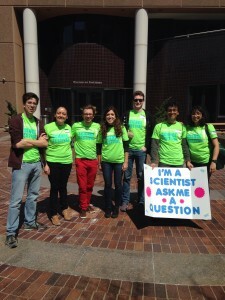 This year, I got involved by organizing a Boston version of the Science Train. 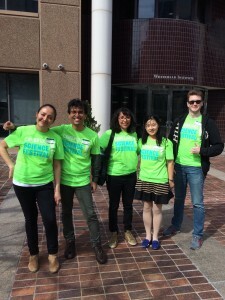 On Saturday, April 15, small groups of scientists donned their lime green volunteer T-shirts, picked up posters reading “I’m a scientist, ask me a question” and jumped on the T (the Boston/Cambridge subway) to go where the people are and interact with them in a space where we knew they’d be anyway. Bringing science to the public like this isn’t an original idea; we were inspired to do this for the Cambridge Science Festival after hearing about previous Science Train successes in New York. By adapting the idea to run in concert with the Cambridge Science Festival, the Science Train not only served as outreach but was also promoting the festival and the broader selection of science events taking place in Cambridge. Organizing the Science Train mostly entailed sending a lot of emails. It was important that the MBTA know what we were doing, we had to work with the Cambridge Science Festival to synchronize message and branding, and we had to recruit volunteers for the Science Train itself so that we’d get enough to make it a success. We found post-doc associations like the one at MIT to be particularly helpful for recruiting volunteers who were willing to ride the T with us. I also worked to divide the volunteers into shifts and small groups, making sure that there were a variety of scientific backgrounds on each of the teams to cover what was sure to be an array of questions that could come up. Science Train volunteers. Photo by Erin Podolak. The volunteers came back saying the Science Train was a worthwhile activity, but that trying to figure out the best way to approach people could be a little awkward. The red line, which runs through Cambridge itself, tends to serve a more science-minded crowd simply because it runs beneath most of the universities and research areas. Other train lines like the orange line cater to groups of people that probably have less exposure to science and scientists on a regular basis. The scientists on the red line seemed to have an easier time initiating conversations, and my explanation is that people on the red line were more comfortable actually asking questions and/or jumping into a conversation with a scientist. For the most part, the volunteers reported that the questions were things they were able to answer. However, in some groups where there wasn’t a scientist of a particular specialty, it could be hard to answer what was asked (like a biologist being asked a question about the boiling point of peanut butter). A few volunteers did get a question or two that veered into awkward territory, like personal health questions, which prompted them to explain they weren’t medical doctors. One groups of volunteers was also asked about the existence of God and what their thoughts on religion are, which we’re told got a little bit uncomfortable. Some volunteers also mentioned that some people took the sign “I’m a scientist, ask me a question” as a challenge, purposely trying to stump the volunteers rather than have a conversation. 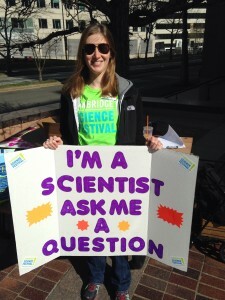 We might word the signs differently in the future, but, by and large, we met our goal because the scientists were able to interact with people about science in a place where they already are, bringing science right to them and making science (and scientists) seem a little more approachable. Volunteer Scientists ready to ride the Science Train. Photo by Erin Podolak. I think activities like this can be hard to execute well, but they can be really successful if you get enough buy-in from excited volunteers and the powers-that-be. It’s definitely important to know your audience and understand what you might be getting yourself into. This is the kind of activity that might be most successful if there is at least one person per group who is really comfortable and confident in their science communication abilities. An activity like the Science Train isn’t for the timid. Without a guide or examples to follow, it might be really challenging to use it to learn how to do science communication. Of course, when asking for volunteers whom you haven’t met, it can be particularly difficult to find the right mix of people who are going to be successful at sharing science in this format. I believe strongly that communities benefit from in-person engagement with science and scientists. That said, not all engagement works or is a good idea. The Science Train definitely worked, but getting to know the teams of volunteers in advance and designing different posters are things that I’ll look to tweak in the future. I’m glad I had an opportunity to volunteer for the Cambridge Science Festival and run the Science Train. Not being a scientist myself, I think organizing this event was a great way to help make community/scientist engagement a reality. Thank you to all the volunteer scientists who spend their Saturday on the Science Train, here’s to more community science engagement in the future.